This dish was introduced by one of the old friends years back. So, I envisioned and cooked this dish at home recently, with the ‘recipe’ left in my memory. So, I would say this dish is more like an adaption of his original recipe which supposed to use prawn with shell intact, rather than my ‘curled-up’ prawns. I did it this way to save me from peeling the prawn shells over dinner, and hated if were to dirty my hands during meals. And, with the shaped prawns, I think it makes the dish look more presentable, at least it was to me. 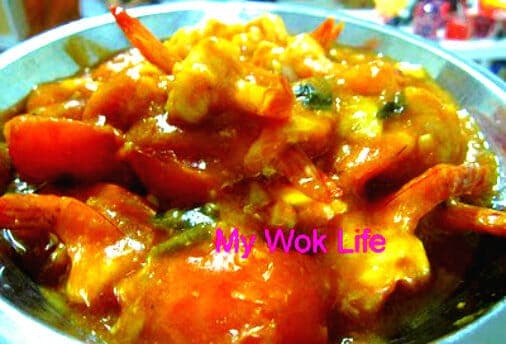 Well, of course, some may prefer the whole prawns as it is believed to enhance the flavor of the dish with the seafood taste. It’s up to you. Many children would love this dish as it has this sweet tomato and egg drop gravy which complements the rice so well. I loved the gravy! Omit the addition of bird’s eye chili, if you or your kids can’t take spicy food. As for me, I liked to add a little of it since all of us could handle spicy food pretty well. I have to emphasize that this dish is easy to cook. It takes less than 30 minutes to prepare and serve! 1) Shell the prawn with its tail remains intact. Then, cut a very deep slit at the back of the prawn. Devein. Then, hold the tail and bend it forward to poke through the middle of its body and pull up till the tail is pointed up (through its body). Repeat step till all prawns done. Season with just a touch of salt and pepper. Leave aside. 2) Heat wok with oil over high fire. Add garlic and stir-fry till golden browned. Reduce heat to medium-low fire. Return prawns to the wok, and stir fry constantly for about 2 minutes, or until prawns are lightly pinked. Add tomatoes and condiments mixture into wok. Stir-fry to combine well. Squeeze/ add lime juice into wok in one circular motion. Stir fry a little to mix. 3) Increase heat to high fire, now. Then, break egg into a bowl. Pour the unbeaten egg into the wok, and stir-fry all ingredients vigorously to mix well. Gravy should be thicken by now. Heat off. Serve with steamed rice. 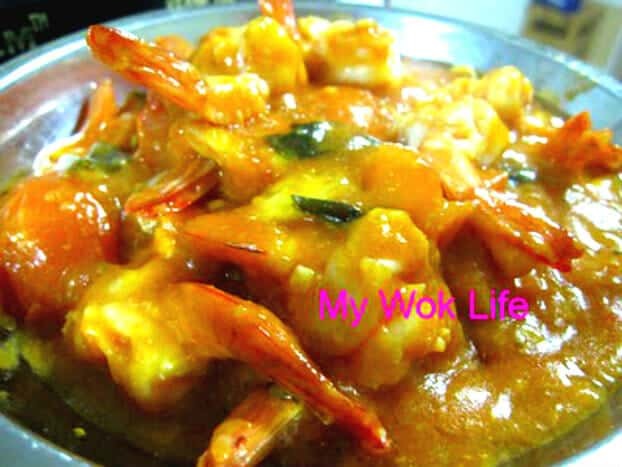 A portion of my prawns with thick gravy (about 5 – 6 prawns) counts about 250kcal. Tips: Get a tub of original miso paste from major supermarkets. If you do not intend to use the miso paste too often, get a packet of individual mini-sized packaging miso paste. I got mine from NTUC Fairprice supermarket (Japanese food/ products section). * The texture of gravy is depend on how thick or watery you desired. Increase the amount of the condiments and water, if you prefer more watery base. If you want it to be even thicker than my version, or find your cooking is too watery for you, you may consider adding some cornstarch slurry to further thicken it. * Bird’s eye chili refers to the small chili. Very spicy and pungent type as compared to those larger red chili.